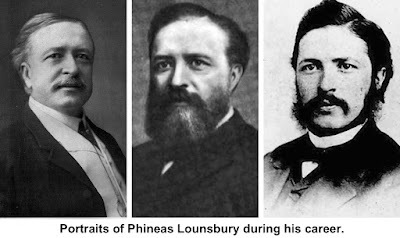 Although he was governor of Connecticut – the first of two Ridgefield brothers to run the state, Phineas Lounsbury is better remembered today as the man who built what’s now the Community Center, a building of several names. 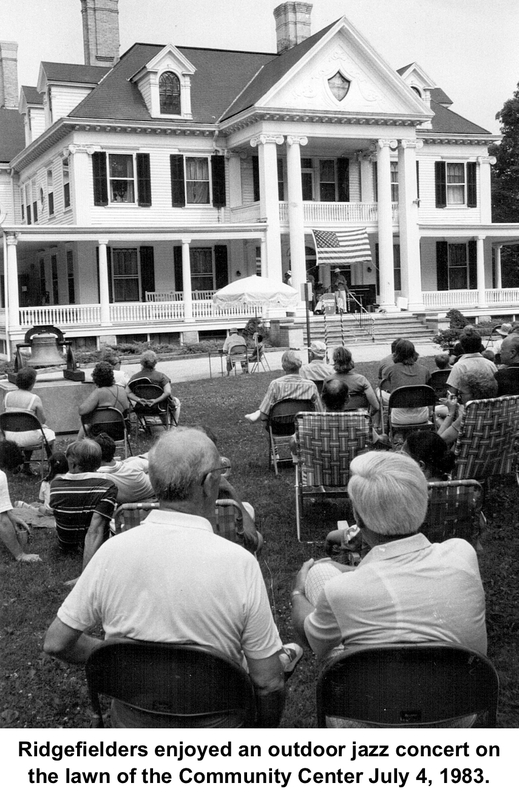 Officially titled the Veterans Memorial Community Center, the place is also today called the Lounsbury Mansion. The governor himself, however, called the place Grovelawn. Born in 1841 on the family farm, The Hickories, in Farmingville, Phineas Chapman Lounsbury attended the Farmingville Schoolhouse and later the Florida Schoolhouse as a boy. Lounsbury got his equivalent of a high school education from the Rev. David H. Short’s private school at the corner of Main Street and King Lane and went on to graduate from Wesleyan University. business. After the Civil War broke out, he enlisted as a volunteer in the 17th Connecticut Infantry in August 1862, but due to a serious illness he was honorably discharged that December. While he left before his unit did any fighting, he became active after the war in the regiment’s veterans organization, serving as its president for a while. 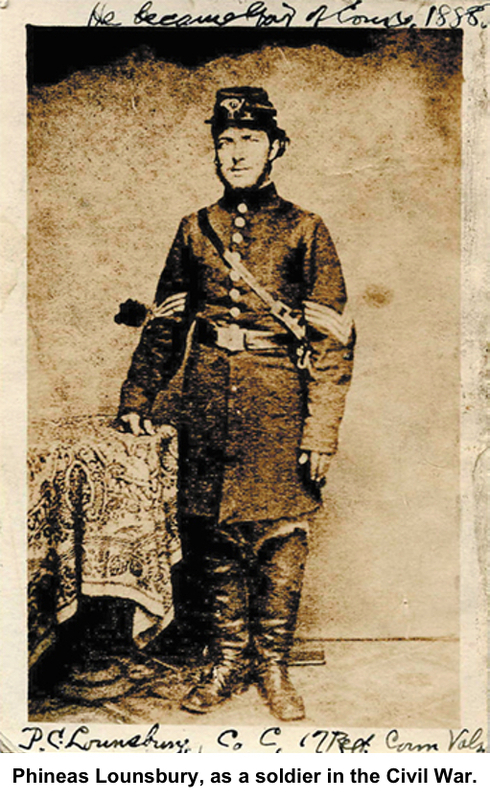 He “delivered a 42-minute oration at the dedication of a monument to the regiment at Gettysburg in 1884,” reports Jeremy Main in a profile of Lounsbury that appeared in The Ridgefield Press. 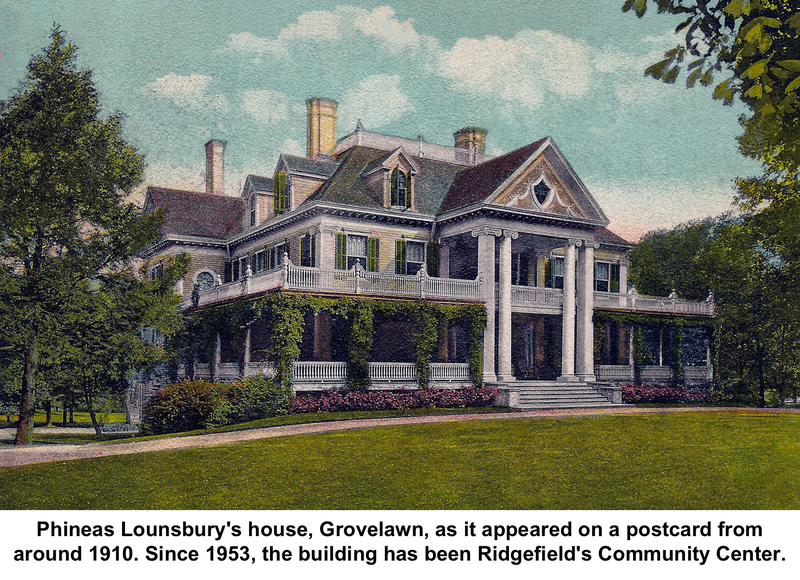 Lounsbury returned to Ridgefield where he joined his brother, George, in a shoe manufacturing company under the name of Lounsbury Brothers — their father, Nathan, had been both a farmer and a shoemaker, as had a sizable number of Ridgefielders of the mid-19th Century. The factory was at first located in New Haven, but later more conveniently in Norwalk. Over the years he also served as chairman of the board of Atlantic National Bank and on the boards of many other businesses, including Ridgefield’s First National Bank. He began his political career in 1874 when he was elected a state representative from Ridgefield. His knowledge of financial matters and his oratory skills led him to become a Republican party leader and, in 1887, he was elected governor of the state. In Sept. 3, 1872, a Town Meeting voted 104 to 49 to ban the sale of intoxicating liquors in Ridgefield. However, by April 1873, some Ridgefielders were getting thirsty. Twenty-five men turned in a petition to rescind the ‘‘no license’’ vote. Up stood Phineas Lounsbury. Unlike George, Phineas was a leader in the temperance efforts. He moved that the vote be taken by paper ballot and that the voting box be kept open for two hours, presumably to allow him to run up and down the village street to gather supporters. When the ballots were counted, 104 favored alcohol sales, and 111 opposed. Ridgefield remained dry. Battles over prohibition continued for years, with Phineas Lounsbury always among the leaders of the teetotalers. Late in life, Lounsbury owned The Ridgefield Press and told its small staff never to run advertisements for alcohol. One day, he picked up the paper, saw a liquor ad and was so angry, he immediately sold the paper. Despite their different views on alcohol, the brothers remained close. 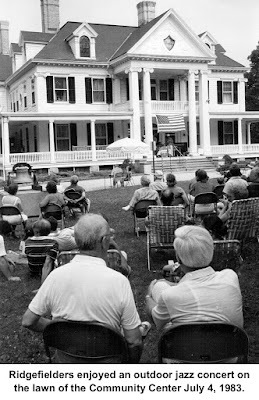 Speaking at Ridgefield’s Bicentennial celebration in 1908, Phineas called George “one of the best brothers that ever lived — one of God’s noblemen.” George had died four years earlier. Lounsbury made contributions to the community, including donating in 1882 the land for and part of the building cost of the Center School on Bailey Avenue — he would probably be a bit disappointed that his gift to education is now a municipal parking lot. He also donated a fire engine, worth $1,000 (about $30,000 today), to the new fire department formed after the great fire of 1895 that destroyed much of the village (his house was only a few doors from the southern limit of that blaze, and he no doubt was especially sensitive to the need for fire protection). “He was a generous, if somewhat ostentatious, donor to the Methodist Church,” reported Jeremy Main. “When the plate came around, he held up a $5 note so people could see how much he was giving.” (It was equivalent to more than $140 today). the colonial-style building into a snazzy Victorian with mansard roof. 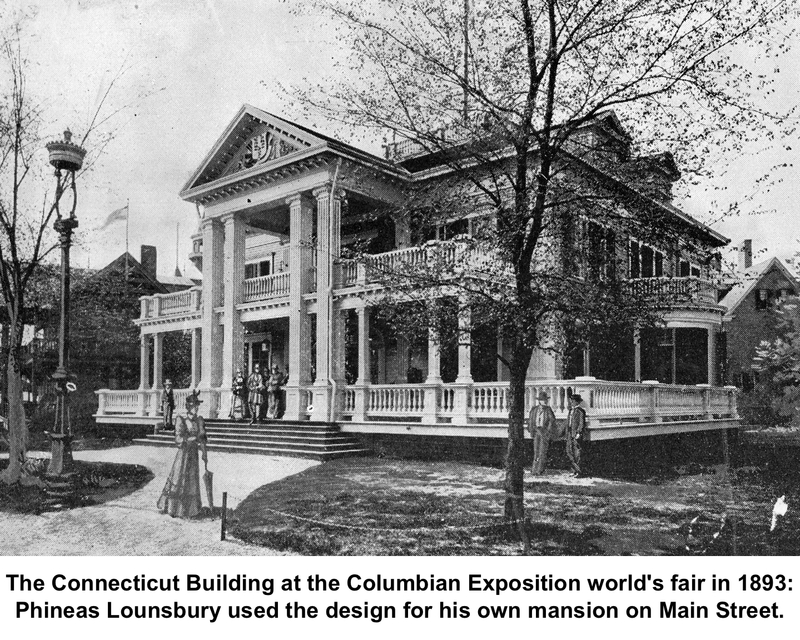 However, attending the Columbian Exposition in Chicago in 1893, Lounsbury was impressed with the stately design of the Connecticut Building, and decided he’d like a new house of similar design. To make room for the new place, he moved his old house to Governor Street, where it served as a boarding house and then office building until it was torn down in 2014 to make way for the Ridgefield Visiting Nurse Association headquarters. Grovelawn was completed in 1896. It had a staff of 14 people indoors, and 12 for the grounds, which included almost all of today’s Veterans Park block, plus where the Boys and Girls Club is now. He also had places in upper New York State and in Florida where he’d spend parts of the summer and winter. Lounsbury had no children, and his estate was left to a niece who had little interest in living at Grovelawn. The house sat unused for almost 30 years. As World War II came to an end in 1945, the town voted to buy the property as a memorial to veterans, and created the Ridgefield Veterans Memorial Park. However, it wasn’t until 1953 that the mansion was leased to the Veterans Memorial Community Association, a private non-profit group that would run the building as a place for meetings, classes, social events, youth camps, a rifle range, a nursery school, and even a teen center. One of the more unusual features of the property is a bell mounted on pedestal. 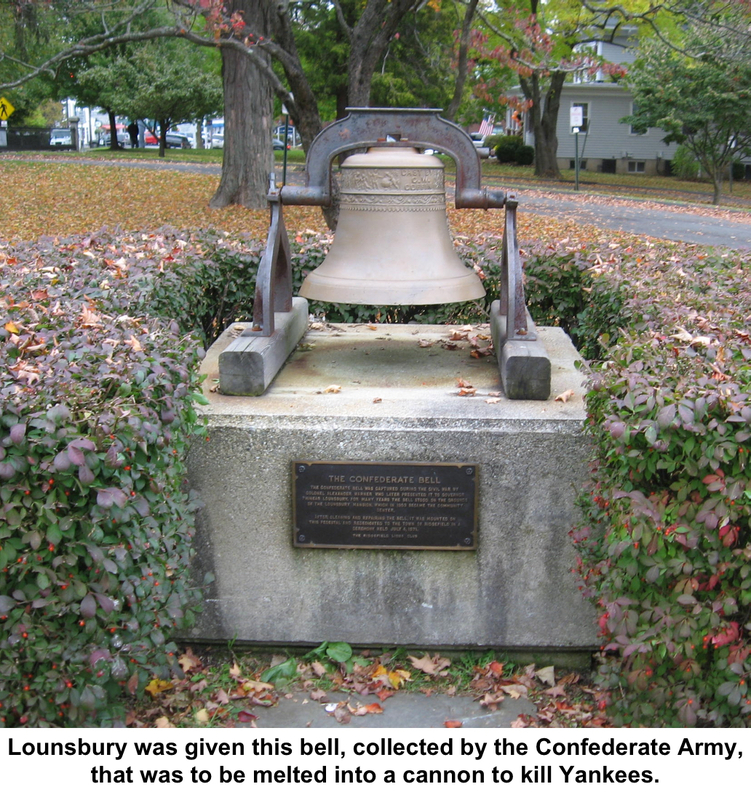 Cast in 1845 in Ohio, the bell had been gathered, perhaps from a schoolhouse, during a Confederate Army scrap drive, to be turned into weaponry. The scap collection was captured by a Connecticut unit led by Colonel Alexander Warner. 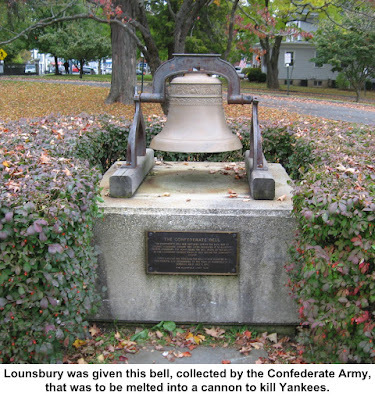 Painted on the bell were the words: “This bell is to be melted into a cannon — may it kill a thousand Yankees.” Warner bought the bell from the Army, kept it for a number of years and eventually gave it to Governor Lounsbury. The bell was rung to mark the signing of the armistice at the end of World War I and again, in September 1945 to mark the end of fighting in World War II.